Hotel check-in is available from 3pm. If you arrive earlier you can store your bags at reception then head out to explore the city before returning for check-in. This evening is our tour welcome evening in readiness for two amazing days at Augusta National. Meet your Fanatics tour rep & fellow travellers in the hotel lobby this evening for complimentary welcome drinks (local beers & wine). Please note for security reasons we do not send tickets/badges in the post - instead your tickets for the golf will be distributed in person by your Fanatics reps at your hotel in Augusta (passport ID & signature required). Get your camera ready! After breakfast, we depart the hotel and walk to Augusta National ready to experience the festive atmosphere of the Par 3 Contest. Today is the only day that cameras & autograph hunting are permitted so make sure the battery's fully charged. In addition to this afternoon's Par 3 contest, today is the players' final full practice round - it's your chance to explore all 18 holes of Augusta National plus photograph yourself at every famous tee, fairway & green. Be sure to visit the par 3 16th as players attempt Wednesday's traditional skimming-the-ball up onto the green - you might just witness a remarkable hole-in-one. As usual our complimentary evening drinks & snacks will be ready and waiting at the hotel when we return from Augusta National for another fantastic evening of socialising. 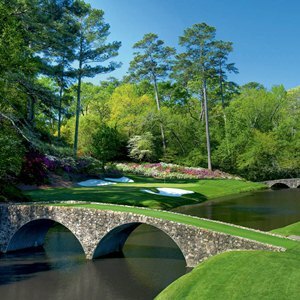 This is it, round one of the 2018 Masters! Once again we walk to Augusta National ready for a full day of golfing action starting with the traditional 1st tee ceremony featuring the game's past great champions. With the field divided into groups of three and tee-off times right through to 2pm it's the perfect opportunity to follow a variety of stars around all 18 holes as well as spend some time seated in the stands (or on your $30 folding chair available from the merchandise stores) alongside your favourite green or tee. Tonight we again enjoy socialising with our complimentary evening drinks & snacks at the hotel before heading out for dinner.